Carthagena was a predominantly African American community in Mercer County, Ohio. Augustus Wattles founded Carthagena in 1835 in Mercer Country near Sidney, Ohio. Wattles was a Quaker teacher who wanted to open a school for African Americans in the vicinity. He hoped that Carthagena would become a settlement for freed slaves from the South. A number of African Americans moved to the area, and Carthagena prospered in its early years. Carthagena became the center of controversy in the 1840s. Virginia slave owner John Randolph had left a will upon his death that freed his slaves and provided them with land in the vicinity of Carthagena. When the former slaves tried to make their way to the community, white mobs confronted them and drove them away. The former slaves were forced to scatter. They settled in a number of other Ohio communities, including Piqua, Sidney, and Xenia. 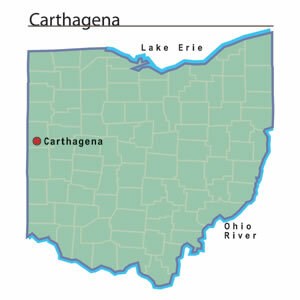 The incident at Carthagena illustrates that prejudice existed in Ohio during the years before the American Civil War. Ohio was a state that did not allow slavery. Nevertheless, that did not mean that whites were open to granting African Americans equal rights. Free blacks found that it was difficult to get fair treatment.